Note: This post contains Amazon Affiliate links. If you click a link and make a purchase through it, I may or may not receive a small commission that will be used to purchase more books. There is no extra charge to you. 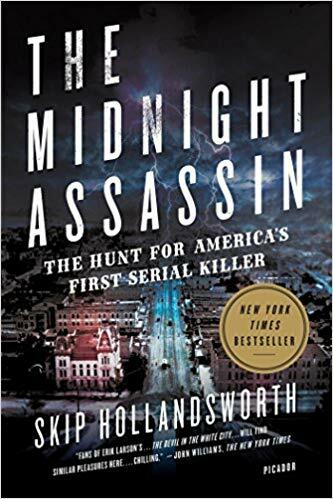 Skip Hollandsworth’s triumph, “The Midnight Assassin: The Hunt For America’s First Serial Killer”, examines the newspaper reporting of 1880s Austin, Texas as it emerged from desolate farm town to cosmopolitan metropolis. Where the history books fail, the newspapers reveal. Where descendants of the victims, servants’ employers, suspects and police officers were unaware, the microfilm informs. It seemed the city of Austin wished to bury the crime spree since they couldn’t bury the suspect. I’m familiar with Hollandsworth’s writings on the Midnight Assassin. Twice he’s published articles about him and his rampage in Texas Monthly magazine. Twice prior to my reading his book, my mind was left to wander and speculate about the identity of this mysterious monster. The Midnight Assassin terrorized Austin in a manner previously thought to be unfathomable. He butchered first servant women with brutal savagery before moving on to affluent white women. Committed before the term “serial killer” was a part of our vocabulary, before the forensic sciences were a sophisticated discipline deployed by the criminal justice system, before highly trained investigative agencies like the FBI were in existence, the Midnight Assassin’s trail ended like a confused, braying bloodhound as it fades into the distance. What intrigued me most was the police constables investigating Jack the Ripper’s murders in Whitechapel were curious about the Austin murders. Perhaps, Austin was the Ripper’s training ground. In the end, both left more questions than answers and unfortunately for both cities, there would be no revelation. Was H.H. Holmes, the madman who built a hotel in Chicago during the 1893 World’s Fair to lure his victims, also the Midnight Assassin? I’ve heard it also theorized Holmes is Jack the Ripper, but to me, the triangle drawn by these three Victorian-era murderers seems unlikely. Maybe time will reveal the answer of “who” – maybe there’s a dusty old steam trunk in an Austin attic holding the key to the identity of the Midnight Assassin. Maybe there’s a long-lost file in a rarely entered room at a London building that reveals the identity of Jack the Ripper. Maybe they’re all the same man. Maybe our history is filled with more monsters than what we care to admit. Whatever comes next, a simple truth remains - I’m intrigued by what I don’t know.